I have become so enamored of skishoeing with the Hoks and a single pole that we will sell them this year on the website. A few of us have been out scouting and cutting this summer already (see pics) and are getting quite the stockpile. Lodgepole pine is the wood of choice, very strong and supple. 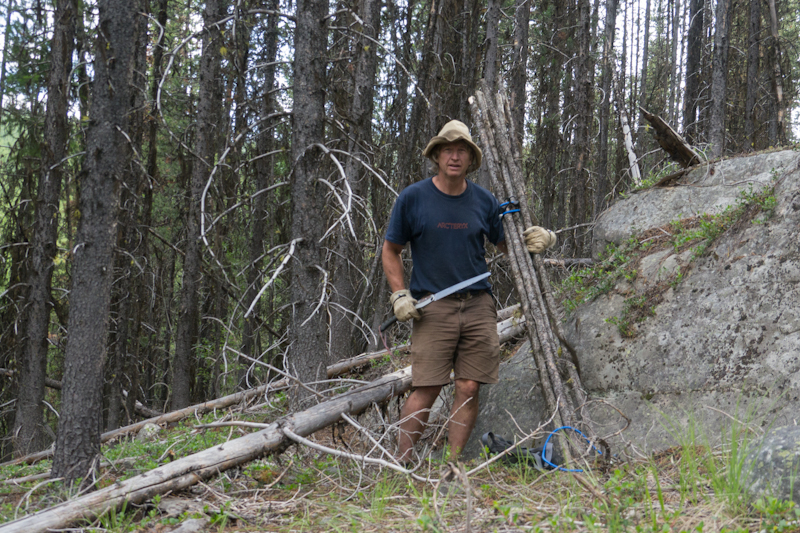 There are lodgepole thickets high the mountains around here where altitude, rocky soil, and tight stands conspire to keep growth rates incredibly low. I just measure a lodgepole less then 1.5 inches in diameter and it is just about 50 years old (hard to count the rings they are so tight)! Keith Wakefield’s pole gathering rig. I have experimented with size and length this year and have decided that 12-16 inches taller then your height is a good length. Once seasoned they will be peeled and prepped for use. The poles will be finished with a penetrating oil and have a cord through the handle end. The base end will have a wedge cut in, handy for scraping snow off the top of skis. We are also having a small ‘AS’ brand made that will go on the handle as well. 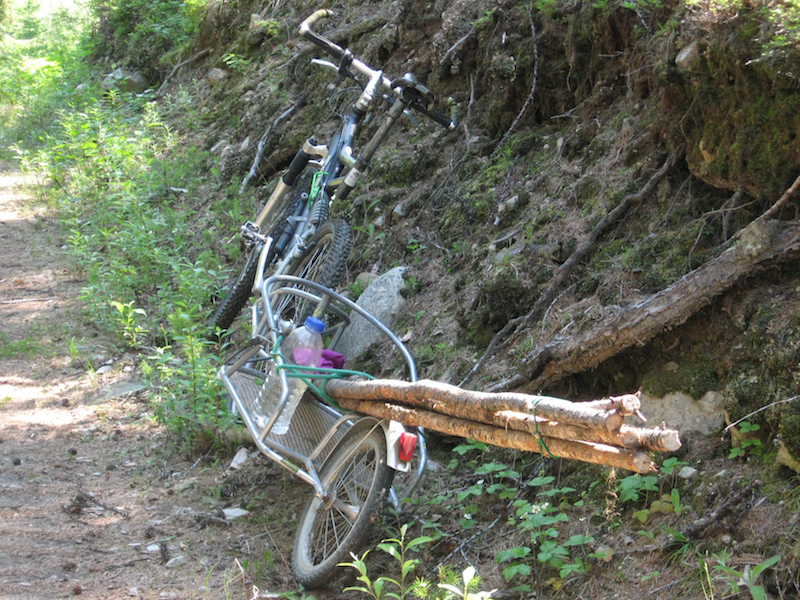 Like the Hoks the Tiaks (tīăk – the Altai word for their single poles) will be simple, durable, and easy to use. They will look great too! Nils with fresh cut poles. Traditionally the ski poles we use for both nordic and downhill have several uses, on nordic skis the main one would be propulsion. With a smooth based ski you can get a lot of glide with a well executed pole push, and when climbing your poles can reduce your back sliding. On nordic skis the effective push is reduced when breaking trail in deep snow and in these conditions many skiers revert to using their poles for balance, problematic because with two poles you are constantly throwing your weight from side to side. Using two poles effectively is not intuitive, and I have spent days trying to teach both nordic and downhill skiers effective poling. Downhill skiing uses poles a bit differently. The poles are shorter and are used primarily as a timing device for turns and as a way to position and move our bodies (our center of balance) down the hill into the next turn. As a lesser use, since we are on skis with zero grip we also use them to gamely try and push ourselves around as best we can. Maman climbing with a Tiak in the Altai Mountains. At the point you put a climbing skin on the ski you reduce free gliding enough to make the pole push more of an energy draw then gain, and with the climbing skin back slipping is much less of an issue. But the biggest advantage of the single pole is its ability to form a tripod with the pole and your two skis. Tripods are inherently stable in a simple intuitive way, and when one of the legs is moved (the pole), very adaptable to uneven ground. The use of a pole puts the skishoer’s center of balance a bit back on the downhill, creating a really stable position in a wide variety of snow conditions. The Hoks are short (particularly the 125), a great plus for maneuverability and turning but the disadvantage of a short ski is less stability fore and aft. The single pole quickly eliminates this problem. Tursen Skiing through the Altai brush. Of special note is the use of the single pole on downhills. Despite seeing modern telemark skiers switch the pole from side to side as they make turns down the hill, the single pole is not moved from side to side while turning and is kept on the favored side on a downhill run, with the end of the pole drifting from side to side behind you, providing the balance where its needed at any given moment. The only time I found it useful to switch sides is on a steep sidehill, where the pole support up hill is excellent for a stabilizing a steep traverse. There are many other uses I have come up with for the single pole. 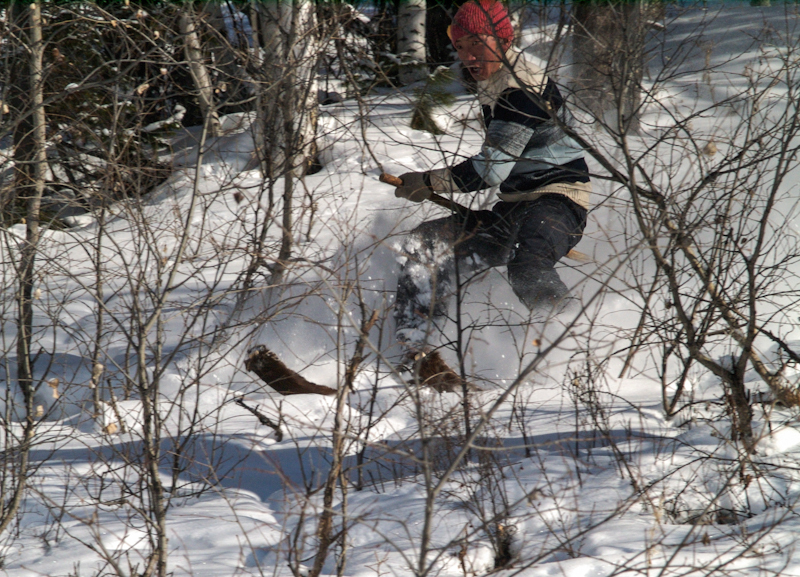 It’s great for clearing branches of snow when moving through the forest. It’s great for breaking low branches too – perhaps on your favorite ski run. It’s a great probe…. I will write more on this later. Suffice to say, I am looking forward to a great winter of skishoeing (Hoking!) and the pleasures of a single pole.